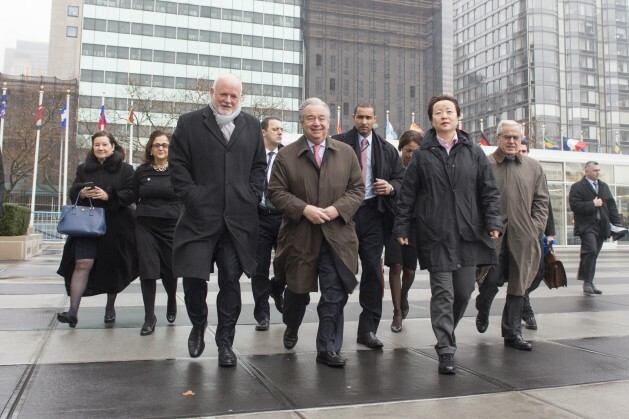 UN Secretary-General Antonio Guterres (centre) arrives at UN headquarters. Credit: UN Photo/Eskinder Debebe. UNITED NATIONS, Jan 3 2017 (IPS) - Antonio Guterres of Portugal officially took up his position as ninth Secretary-General of the United Nations Tuesday morning, beginning his duties by addressing UN staff in New York. Guterres emphasised the urgency of addressing the plight of refugees and displaced populations, calling out richer nations for their negligence in addressing their global responsibilities, an issue many expect him to target upon taking office. In his speech Guterres also emphasised the importance of multilateralism to address global problems. Prior to becoming Secretary-General – a role he will initially hold for five years – Guterres was the UN High Commissioner for Refugees (UNHCR) from 2005 to 2015. He oversaw the UNHCR during a time when the number of displaced persons worldwide grew to its highest number since World War II, exceeding 65 million. He is recognised for having managed the UNHCR’s response to the refugee crisis in the Middle East and Africa while also cutting staff and administrative costs and instituting wide-ranging reform of the organisation. He has pledged to bring a similar approach to the UN. A number of key positions appointed by Guterres embraces diverse representation in the upper echelons of the organisation, and address the lack of gender parity to which previous Secretaries General had pledged to reform. Nigeria’s Minister for the Environment Amina J. Mohammed was appointed Deputy Secretary-General. Under-Secretary for Asia and the Pacific at the Brazilian Ministry of Foreign Affairs Maria Luiza Ribeiro Viotti becomes Chef de Cabinet. Guterres created the role of Special Adviser on Policy, Kyunga-wha Kang of South Korea who has previously served as Assistant Secretary-General and Deputy Emergency Relief Coordinator. The role of Assistant Secretary-General for Strategic Coordination in the Executive Office will be filled by Fabrizio Hochschild, former Deputy Special Representative for the UN Mission in the Central African Republic. Guterres was also quick to recognise the scale of the problems and the need for unity among the UN’s 193 member states to address them. The outgoing Secretary General Ban Ki-Moon described Guterres as a “wonderful choice” to lead the United Nations. “He is perhaps best known where it counts most: on the frontlines of armed conflict and humanitarian suffering.” Guterres inherits a complicated Syrian peace process; the highest number of migrant populations since the 1940s; increased tension between Israel and Palestinian; and a renewed push to admonish countries projected to fail to reach agreed climate change targets.